If you're trying to send a series of messages to your customers, given some initiating behavior, the first step is to create a single-touchpoint campaign as laid out in the campaign management article. The initial setup is the same - you'll still need to choose your segment, apply any relevant campaign constraints, and apply a template to your first touchpoint. To add a second touchpoint, just click the blue "+" icon below the first touchpoint! Once you've added your second touchpoint, you'll notice some additional options. Between each touchpoint in your series, you'll be able to specify the amount of time to wait before sending out the next touchpoint. To set your delay, click "Set wait time" and choose a timeframe. This delay time is the least amount of time a recipient will have to wait before they get the next touchpoint. Once the delay time is reached, we will try to send the customer the next touchpoint every hour until we either succeed given all configuration settings, or the customer has been unreachable for the specified allowed amount of time (see the "unreachable" exit criteria below). You have additional flexibility in specifying what time of day your customers will receive later touchpoints. By choosing a time, you'll make sure that your customers all receive the touchpoint at the time of day you prefer. Even further, you can choose to send at that time in the user's local timezone! Note: This is only available for touchpoints 2 and later, since touchpoint 1's send time is configured separately where you set up the initial send time for the entire series. Say you specify a delay of one day between touchpoints 1 and 2, and you also specify a time of day of 9am, using the recipients' timezone when available. A customer receives touchpoint 1 at 3pm. They become eligible for touchpoint 2 after one more day, at 3pm the next day. We will then wait until the 9am hour the next day (in the user's timezone, if known) to send the next touchpoint. As the above example shows, keep in mind that when sending in user local timezone, the message can go out to a customer up to 24 hours later than otherwise expected, as once the users qualify, we still have to wait for the right time of day to send the message. One last note about the send time - you'll notice that only the hour of the day can be selected, not the minutes. When using this feature, we can only provide granularity down to the hour level. This means that if you specify a 9am send time, we'll send the message anywhere between 9am and 10am. Below your Constraints, you'll notice an Exit section - this becomes available when you have multiple touchpoints. 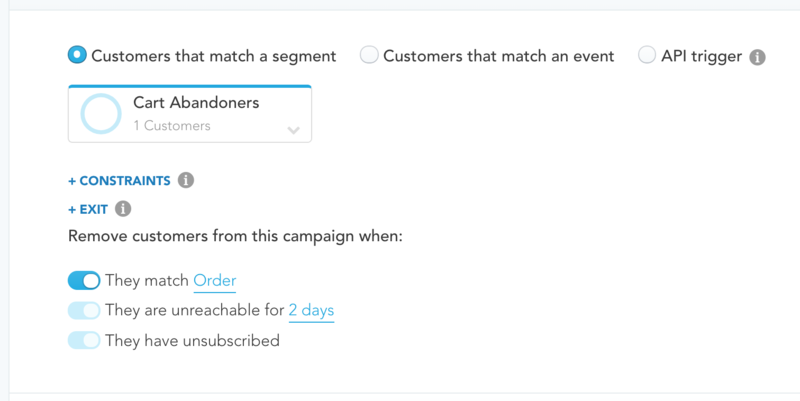 These exit criteria allow you to remove customers from the campaign series if they become disqualified for the campaign in the middle of the series. This will ensure customers stop receiving later touchpoints in scenarios where the content has stopped being relevant or the customer has specifically asked to not be sent additional messages. You have the option of removing a customer from a campaign series if they perform a specific action after receiving the first touchpoint. Typically, this action is what you are trying to get the customer to do in the first place - i.e., once they've performed the desired action, you don't need to keep messaging them! To set up this exit event, simply choose an expression in the dropdown at the end of the "They match [an event]" criteria. If you are sending a cart abandonment campaign series, you'll want to stop prodding your customers to make a purchase if they've already purchased something. If you are sending a registration abandonment campaign series, you'll want to stop prodding your customers to register if you've already gotten them to complete the registration process. It is possible for customers to become unreachable in the middle of the series. This happens when they've spent too much time in the series without receiving one or more remaining touchpoints. At some point, the content becomes outdated or no longer relevant, so you'll want to make sure to remove them from the series. This exit criteria cannot be turned off - as stated above, we want to make sure your customers don't receive outdated communications! The default timeframe is one day, but you can change this to whatever timeframe you see fit. Let's say you set up a two-touchpoint cart abandonment campaign series - the first touchpoint is an email, and the second touchpoint is a web push that comes one day later when a customer visits the website. When a customer abandons their cart, they'll receive that first email. Then the system will wait one day before trying to send a web push to the customer. Maybe that customer isn't yet reachable via web push, though - either they never allowed web push notifications in the first place, or they accepted them at one point but then disallowed them. At this point we'll wait the amount of time you specified for the "unreachable" criteria (say, four days). After those extra four days of waiting to be able to send the customer a push notification, we will kick them out of the series. After all, at this point it's been five total days since receiving that first email - they may not be interested in the product they abandoned anymore! Perhaps you're requiring a behavior within the template for a third touchpoint. Say you're requiring that they perform a behavior like "pageview and then PDP view" so that you can target people who visit the website (but still don't purchase) with an extra message to nudge them to buy. However, they haven't visited the website yet. We'll keep waiting that additional timeframe set for the "unreachable" criteria (again, we'll say four days). If they haven't "pageviewed then PDP viewed" within that four days, we'll kick them out of the campaign so you don't have to worry about them getting that touchpoint when it's long since become irrelevant! If a customer unsubscribes, they have indicated they no longer want to be contacted. So, when we try to send them the next touchpoint, we won't be able to. We'll still wait the amount of time set up in the "unreachable" criteria to give them a last chance to resubscribe. But if we hit the end of that window, we will automatically remove them from the series. If you want to set up your entire campaign series, but aren't quite ready to send one of the touchpoints, you can disable that touchpoint through the ellipsis menu in the top-right corner of the touchpoint tile. When you disable a touchpoint, the delay timeframe for that touchpoint will be skipped. Let's say you have three touchpoints. Touchpoint 2 goes out one day after touchpoint 1, and touchpoint 3 goes out one day after touchpoint 2. If you disable touchpoint 2, touchpoint 3 will go out only one day after touchpoint 1 - it won't wait the extra day in between!